Betabrand prepares to open at 780 Valencia St. Photo by Stevanie Wazna-Blank. Local online clothing company Betabrand will open its first storefront this weekend at 780 Valencia Street, previously 780 Cafe. Originally catering mostly to men, the company has branched out to offer women’s products as well. Typical prices are $78 for a gray hooded Henley sweater, $88 for a seersucker wrap dress and $98 for raw denim jeans. The company creates a story for every product. The quirky origin story for the Black Sheep Sweater, for example, describes the actual black sheep that the wool comes from. The Elope Dress is designed for the woman who fancies a wedding on the road. The company’s new space on Valencia won’t just be a clothing store; it will also house Betabrand’s product development process, in which the “making, storytelling and shopping happen in the same place,” Lindland said. Sewing machines on location will be used to make prototypes, with the final products manufactured elsewhere. Materials for most Betabrand products are sourced from Asia and all products are sewn in the SoMa District. The company also plans to use the new store to expand its Model Citizen program, in which fans can upload photos of themselves wearing Betabrand clothes to the company website and get a discount on a purchase in return. Lindland hopes to have photographers available at the store so customers can have a Model Citizen photo taken by a professional and immediately uploaded. Betabrand prides itself on being a sort of idea factory, generating up to 10 concepts for potential products each week. The company also encourages customer interaction with product design. On its Think Tank web page, customers can submit design ideas, provide feedback on how to improve merchandise and vote for favorite designs. The products that receive the most votes are initially sold in limited production; the best-selling items are then offered online and the top 80 percent will be available at the storefront. “The character [of the company] comes from the online experience,” said Liz Rosoff, one of the store’s “show-runners.” Rosoff’s job is to help translate the virtual nature of the brand into the storefront. In addition to having photographers on hand, Betabrand will feature its ongoing public design contests in the store. As a new neighbor in the Mission, Lindland hopes that Betabrand can learn from businesses like Paxton Gate and 826 Valencia that engage with the Mission community. “I’m an Internet person, but now with a neighborhood presence. It’s refreshing,” he said. Many neighbors have already stopped by, at first critical of what was happening to 780 Cafe. But Lindland said that responses changed to be more welcoming when people discovered Betabrand wasn’t another restaurant or coffee shop. 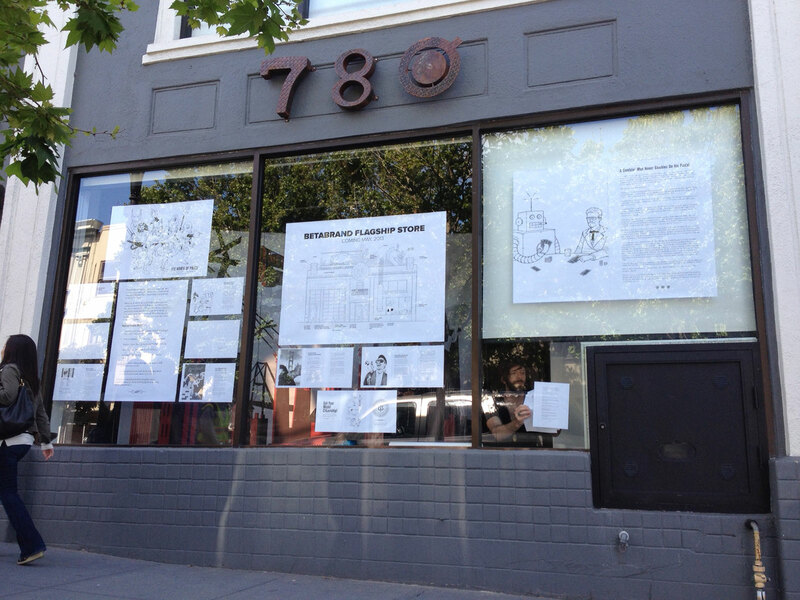 The grand opening of Betabrand’s new storefront is scheduled for Saturday, May 11. Store hours are 11 a.m. to 7 p.m.
what would make it legitimate in your eyes? Great that a new business is going into that space. Betabrand seems like a very good fit for the ever evolving, improving neighborhood. Enjoyed going to the café when it was the Summit. However, the 780 owner did not have it together to keep the place going. Who could afford a 78 dollar sweater? Not good for the neighborhood? They belong downtown. People who shop on Valencia Street, that’s who. One block over, you can get all the cheap clothing you like on Mission Street. I don’t believe everyone on or near Valencia can. Its for a small exclusive group. Awesome that a small local business is moving in here. Nice group of people – and they employ tons of sewers here in the city. I think they’re an amazing company full of talented, friendly people. They’re totally open to being involved in the community and I’m excited to see how they contribute. stoked to check out betabrand’s new store. Ugh. I agree. Sounds more like paid advertisement. I was in to critiquing articles before it was cool.. They know exactly what to say. Not sincere. I’ll be there with all my douchebag friends. It’s a great place to be a douchebag. Then, we’ll go across the street for douchebag tacos at tacodouchebaglicious. Give it up old Mission dude – the times have-a- changed. Douchebaggery in the norm. Let’s see how they give back to the neighborhood or will they just sell stuff like the $178 sweatshirt on their website? Is creating a hundred jobs by making all their stuff in SF “giving back to the neighborhood” enough for you? Depends on who they hire, to be honest. cutters, sewers, salespeople, designers, clothing producers, programmers, marketers….. who should they be hiring? The same people who get uppity about price are all about supporting neighborhoods, locally-made stuff, and fair wages. Guess what? When you make stuff locally and pay fair wages, it’s a lot more expensive? You know why your Target pants are so cheap? Because a bunch of Bangladeshi’s work for pennies in death-traps. You can’t have it both ways. Actually, it is possible to find reasonably priced union-made, USA-made clothing, but mostly online. Union-line pants, shirts, jackets, sweats. There are plenty of other online resources. I’ve been buying most of my clothes from these outlets for about the last 10 years. Of course, I’d prefer to buy them at a local retail store, but it’s hard to find any that sell union-made, especially now that Carhartt has outsourced almost all their products. Acme Surplus, 5159 Mission (at Geneva), has good deals on Wigwam socks. What’s sad and funny is that the CEOs of Betabrand and Target have way more in common philosophically than you care to admit. Whats the difference. They will add to the gentrification (in the guise of homemade, organic, local. I’ve heard it all before) of the neighborhood. Make it more expensive for folks to rent here, displace working class folks who have made this area their home for decades and they will make lots of money doing this. Can’t wait to buy a pair of those pants with the pattern going horizontal instead of vertical! That is so badass! I already have quite a reputation among my cube-mates for being a “rebel who codes by his own rules”, and these pants will solidify my mission street cred. THE MAN is not, I repeat NOT, going to tell me how to orient my patterns. I care what people think, but I like to give off a vibe that says “I don’t care what people think”, so YES, sartorial subterfuge with the dress sweatpants is definitely going to be happening! Thanks for opening you guys, I will stop by after my retro shave, and that is so cool that you employ local sweatshops.